The key to writing formulas in excel is understanding Microsoft Excel’s logic. As humans when we consider an equation, we first think the values of the argument. For example if we are to multiple 3 and 5 our brains would naturally structure it like this: 3 * 5= ?. However Excel is programmed to consider the solution prior to the calculation, this is normally as you are specifying to excel; ” I want you to put the answer to this equation in this destination”. 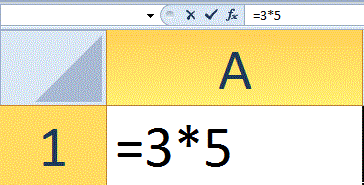 Therefore Excel’s formula logic begins with the “=” (equals) sign. 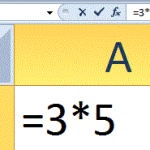 To write the example above for excel we would write = 3 * 5 then press enter. The cell in which you place the equals sign is the cell where the formula will be housed and the destination cell where the answer will be returned. It’s a simple but necessary way of shifting your naturally programmed way of thinking to align with Microsoft excels.